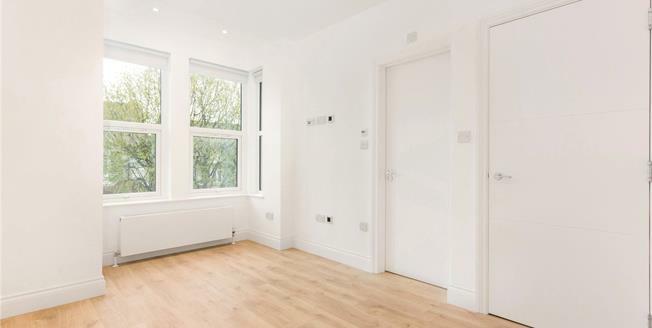 A spacious and naturally light newly refurbished three bedroom apartment in East Finchley close to great transport links and with desirable Schools nearby. This apartment is on the first and second floor of a beautiful Edwardian house and offers over 879 sq ft of recently refurbished living space, with new double glazed windows and wooden floors throughout. The first floor comprises of a reception room with direct access to a southerly facing roof terrace and separate modern and well-designed kitchen with an extensive range of white gloss units providing extensive storage with Quartz stone work surfaces and a range of integrated appliances. The master bedroom has the benefit of a stylish bathroom with glass shower-screen, wall-mounted basin storage unit, stylish tiling and under-floor heating. Stairs with a Velux window cleverly added lead to the second floor comprising two double bedrooms, eaves storage and a shower-room with marble tiles and sloping ceiling. Sylvester Road is a quiet residential road moments from many popular restaurants, cafes and shops with excellent local bus routes and access to Finchley Central or East Finchley (Northern Line) underground stations.